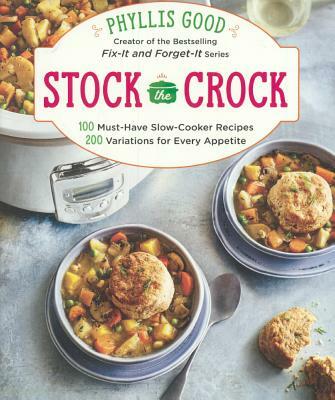 Stock the Crock brings together the expertise of America's most popular slow-cooker authority with a fresh collection of 100 essential, innovative, and easy-to-prepare recipes-each with variations allowing readers to customize the dish according to their dietary needs. You'll find beloved classics, as well as dishes you might be surprised can be done successfully in a slow cooker. (Hello, slow-cooker creme brulee ) Whether you are looking to accommodate gluten-free, paleo, or vegetarian diets, or prefer slow-cooker meals perfectly sized for one or two people, this cookbook provides smart ideas, more than 100 recipe photos, and cooking hacks that will change the way you use your favorite fuss-free cooking appliance. Learn simple make-ahead tricks, convenient baking tips, and how to make two recipes at once using the same cooker, so you can simplify cooking and spend more time enjoying your family and friends around a wonderful, delicious meal. Phyllis Good is the New York Times bestselling author of Fix-It and Forget It. Her cookbooks have sold 12 million copies. Phyllis and her husband, Merle, live in Lancaster, Pennsylvania. Visit her at stockthecrock.com.